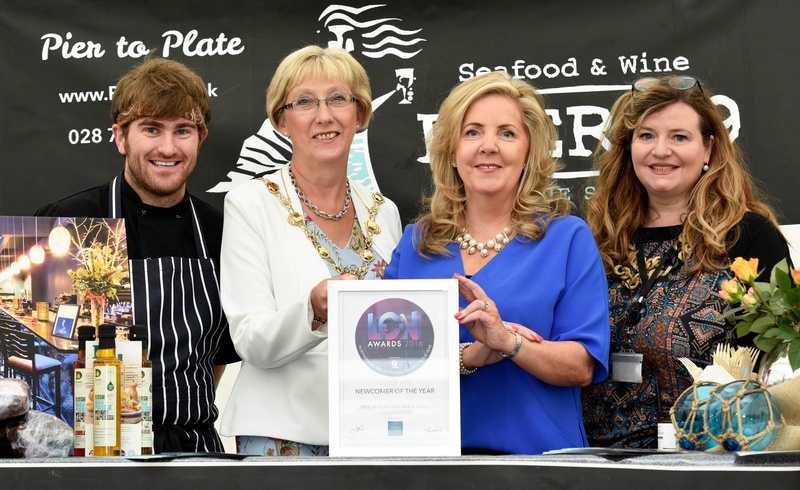 Mayor of Derry and Strabane, Alderman Hilary McClintock has congratulated Pier 59, Derry’s only seafood restaurant, on winning ‘Best Newcomer’ at the Licensed and Catering News (LCN) Awards in Belfast. Ald. McClintock said the award, presented at a gala ceremony in Belfast’s Europa Hotel, was another great accolade for the city’s restaurant sector to celebrate during Northern Ireland Year of Food and Drink 2016. Praising the key role of Head Chef Stephen Forbes in developing an exciting Asian infused menu influenced by his recent culinary travels, Una said: “All our fish is caught here - not brought here - mostly sourced from Greencastle in Donegal; our mussels are from Mulroy Bay, where they are organically grown on ropes and are delicious!” Although the restaurant specialises in seafood, the menu also includes speciality meat, vegetarian and vegan dishes. Photo Caption: Pictured are the Mayor, Ald. Hilary McClintock, Una Kincaid, owner of Pier 59, which won ‘Best Newcomer’ at the Licensed and Catering News Awards 2016, and Stephen Forbes, Head Chef. Included is Mary Blake, Tourism Development Officer, Derry City and Strabane District Council.